Fans and students gathered at Fenway Monday to watch the Red Sox equipment truck load up before departing for spring training. The Boston Red Sox equipment truck departs Monday for spring training in Florida. The truck will begin loading at 7 a.m. and is scheduled to leave Fenway Park for the 1,480-mile trip to JetBlue Park in Fort Myers around noon. This is the 20th consecutive year the equipment truck is being driven to Florida by Milford native Al Hartz. Fans and well wishers turned out to Fenway park Monday to send off the Red Sox equipment truck. 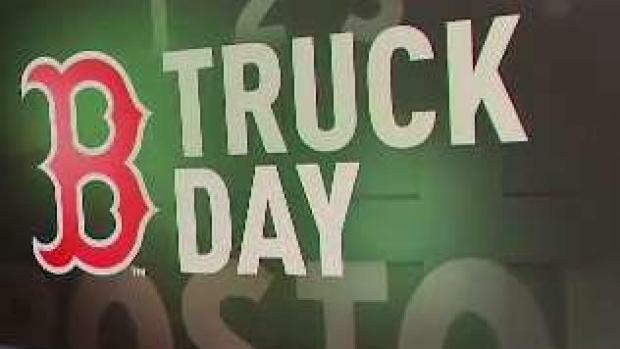 The truck, which will depart from Van Ness Street, will be led by a flat-bed truck carrying Wally the Green Monster, his sister Tessie, and Fenway Ambassadors who will be handing out JetBlue collectable baseball card schedules filled with prizes. They will also be tossing soft Red Sox baseballs to fans. Thirty Boston Public Schools students from the Young Achievers K-8 Science and Math Pilot School in Mattapan will join the festivities this year. The children will get a tour of Fenway Park, attend the sendoff of the equipment truck, and have lunch at the ballpark.